We’ve used words like ‘shoes’ and ‘boots’ to describe tyres many times before, but have you ever wondered what it might be like if you ran a car on actual footwear? We assume not, but just in case, the brilliantly mad Russians at Garage 54 wanted to find out. Did you expect anything less from the people who ran a car on Coke bottles? For this crazed experiment, the centre sections of two conventional wheels were removed and adorned with a series of metal ‘legs’ to hold the shoes. Each shoe was slipped onto a metal insole, and filled with expanding construction foam to hold them steady. 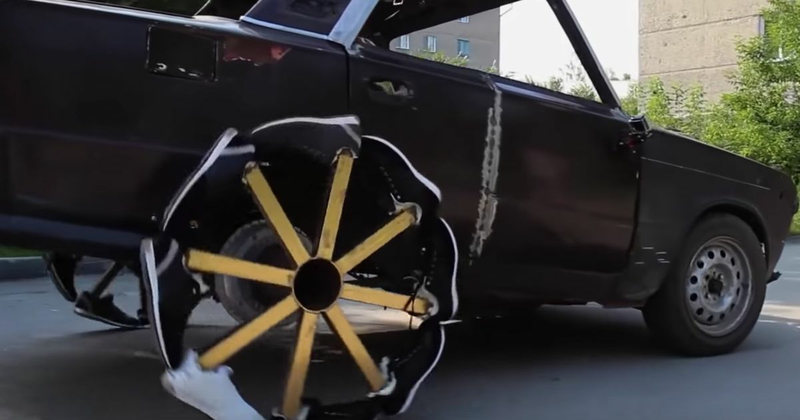 The two donk-like rims were attached to the back of Garage 54’s shortened project car, and damn it, they actually worked. But not without some issues: extreme vibrations even at low speeds threatened to shake the car apart, and it didn’t take long for the shoes to start deconstructing. The man behind the experiment did note that he could make another pair of wheels and “roll the tubing” to give the legs a slight curve, which would help the ride. But, that’s just not their style as “we always chose the hard way, always going full ghetto.” Indeed! Recommended car throttle shop Worldwide Shipping In The CT Shop Car Throttle Submit Your Videos To Get Featured On Our Social Channels DIY Move Aside, AMG: Here's A Homemade 6x6 Lada Niva DIY Here's Why Putting Winters Tyres On Only One Axle Is Stupidly Dangerous DIY Here's What Happens When You Replace A Tyre With 3000 Nails DIY Here’s Proof That 4WD Is Useless On Snow Compared To Winter Tyres DIY Can You Run A Car With The Propshaft Connected Directly To The Engine? DIY What Actually Is Rack And Pinion Steering? DIY That 'Half Price' Totalled Audi R8 Has Been Repaired For $500 DIY Can You Start A Lada That's Spent Six Months At The Bottom Of A Lake?